SAPELE MAPLE MOON :: Tropical African Sapele with Birds eye Maple. Inch & quarter thick and eight inch across with a key hole slot on the rear to hang it up. Im quite pleased with the result, no reason for making it. Just sort of came together messing about. Never used these woods befor but happy to have discovered them both the birdseye maple and the sapele are perhaps becoming my favorites. Really nice Bazz! The contrast, the scrolling, the way the bottom point does not follow the curve of the maple. Another winner! What finish did you use? Thanks for sharing. +1 CFrye … This piece really grabbed my eye, Two of my favorite woods and nicely crafted. Thank you for all your feed back cheers ! Always amazes me here we have people from across USA and even Japan respond in just a short time thank you for you comments . Candy you asked about what do I use as a finnish product, well most of my stuff gets the TUNG OIL plus I like to use Beeswax. 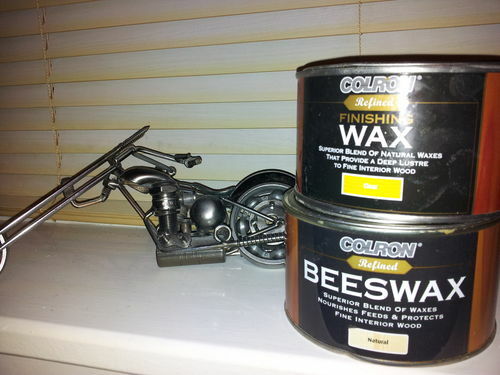 I use COLRON Beeswax plus a finishing wax which is both beeswax and carnauba wax which give a soft glossy finnish. O and Grumpymike glad you like my statement I really mean it, my little 8 foot by 8 foot workshop is where im most happy. Thanks for the info Bazz. The grain of the Sapele is great, but the Birdseye makes it a perfect picture. I’m sure my wife would love one of these and I am sure I have some perfect wood. 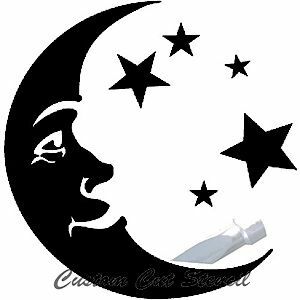 I would have to have a friend do the features of the moon. Love it! Not bad for just tinkering around! Thanks for the great responce to my project :: I have recieved messages & e-mails regarding this as a pattern. Please find enclosed the image I used to create the sapele maple moon pattern. You should be able to copy & paste this image , save it, resize it to what ever size required. If anyone would like to copy my project your welcome, and I look forward to seeing your finnished project. My intention was for the moon face plus stars, but when the birds eye maple worked so well as it is I decided to call it done as the stars would have made it look to busy. So copy the image paste it into your own photo files, then retreve it print it, spray glue the pattern to your timber and scrollsaw the image out. Remove remaining paper pattern useing white spirits “paint brush cleaner” sand shape and perhaps laminate to a contrasting backing board. If you copy & paste the image into your word processor or similar software you can manipulate the dimensions. If you need any more fine details please ask, I am by no means top dog with a PC but I will help if I can. Best of luck BazzA. Bazz, You do some wonderful work. Very creative and inspiring. Thank you for sharing.